What can you study in Exercise Sciences? You can study Exercise Sciences as a major in the Bachelor of Science (BSc). 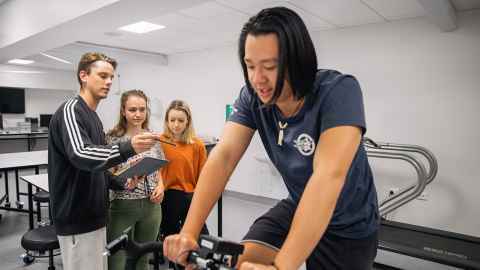 You’ll study the physiological, psychological, biomechanical and neural influences on human performance in exercise, sport and the workplace, in both health and disease. This practical and diverse major will offer you the skills you need to work with people in movement science, health, wellness, rehabilitation and sport science. Laboratory work plays an important role in the Exercise Sciences major and is based around the analysis and evaluation of data collected from humans engaged in physical activity. As part of your major you will complete the Exercise Sciences capstone course, EXERSCI 399 Applying Exercise Science, where you will apply your theoretical knowledge to practical skills in a supervised research project. Selection into this major will require a higher standard than some other majors. What if you don’t meet the entry requirements for Exercise Sciences? If you meet the entry requirements for other majors in the Bachelor of Science (such as Biological Sciences or Physiology), then you should apply for one of these majors. Where can undergraduate study in Exercise Sciences take you? Exercise Sciences is an important discipline that relates to all aspects of our everyday life. Our courses cover human physiology, exercise and sports psychology, biomechanics, and movement neuroscience. Studying Exercise Sciences will facilitate skills for lifelong learning, critical and analytical thinking, communication, independence, collaboration and intellectual curiosity. In laboratory classes you will develop hands-on skills in interacting with human participants and the processes of experimentation. The programme is committed to developing students' knowledge and skills in the exercise sciences, health, wellness, physical fitness, rehabilitation, sport science and clinical exercise physiology.